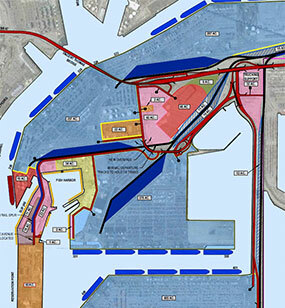 Seaport Master Planning by Cargo Velocity addresses seaports as dynamic systems. We understand the relationship between land-use, automation, intermodal operations, and forecasted demand components. We use an interactive and iterative approach and surveys that enable the assessment of client needs. Through this process, we evaluate limitations and opportunities, develop planning criteria, and propose alternative concept layouts for comparison. 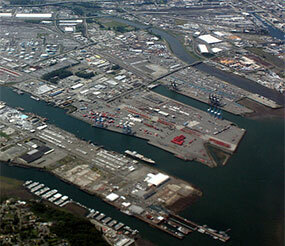 Our licensed civil and industrial engineers offer over 23 years of seaport master planning experience worldwide. Our project managers have very extensive backgrounds in ports infrastructure and operations. Prior port master planning projects by Cargo Velocity and prior experience of Dan Johnson include work for all or major parts of the Ports of Houston, Oakland, Jacksonville, Longview, Los Angeles, Long Beach, Tacoma, Palm Beach, Honolulu, Jebel Ali, Yantian, Namport, Haifa, and Ashdod. In most cases, we worked cooperatively with other firms and the port itself. Please contact us for details about our projects. Developed conceptual master plan alternatives for dry and liquid bulk facilities. Intermodal unit-train planning, access and wharf concepts, cargo demand forecasts, tonnage projections, and related site playouts. Capital cost estimates and weighting matrices for option selection. 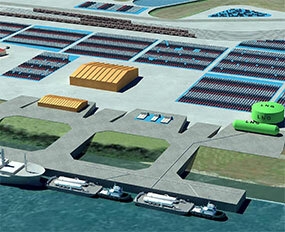 Developed standard and automated terminal conceptual plans for two facilities in one port, each with over 3 Million TEU capability. Provided capacity, throughput analysis, and decision support. Considered alternative future scenarios for development. Developed a range of infrastructure development alternatives based on market forecasts, and alternative assumptions for automation, chassis storage, and cargo demand by type. Facilitated a series of workshops with Port staff and tenants to collect needs and refine multiple high-level land use options. Work considered the rail network, roadway network, expected cargo growth, and needs of tenant firms.